The 4081 Quad Mic Preamp builds on the incredible success of the 1081 and 1081R modules and provides both powerful control and legendary Neve sound. The 4081 Mic Pre is perfect for vocals, ADR and Foley Recording, the 4081's features make it the unit perfect for recording drums as well as a whole host of recording applications. The Neve 4081 Quad Mic Preamp takes the unbelievable accomplishment of the 1081 and 1081R modules further on, delivering potent control as well as the fabled Neve sound. Perfect for vocals, ADR and Foley Recording the 4081's features make it the first choice of any professional set up; whether that’s a studio, OB truck or live stage environment. 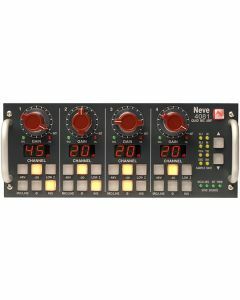 You can use the Neve 4081’s front panel or a proxy remote control (using a Mac or PC with Neve Remote Control software) to take direct control of every one of the quad mic preamp’s astounding features. This provides an unassuming and sophisticated solution for users of ProTools, Nuendo, Cubase and similar DAW systems. The user can create up to 64 independent channels of mic preamps or line level inputs, all controlled from a single computer, by linking together multiple 4081 units. Not that that’s necessary, the Neve 4081 fits four genuine 1081 mic preamp channels into a single 9.5” wide unit. The XLR mic inputs can be alternated between mic and electronically balanced line, and the preamp also makes use of a switchable 48V phantom power supply. Version 2.00 software produces metering information displayed within the Remote Mic Control window, this is passed back from the 4081 unit(s) to the Remote Mic Control software running on the computer being used. A digital I/O option is also available: a Firewire/AES interface with four channels of A/D conversion to either AES or Firewire and four channels of D/A conversion..
Digital I/O Option: Firewire/AES interface with four channels of A/D conversion to either AES or FireWire and 4 channels of D/A conversion. Analogue Insert (pre A/D converter) per channel. The power supply is universal input type and therefore no mains operating voltage setting is required.